NYC is known as the “Big Apple”, but there was something else that was big in this city recently – the smiles on New Yorkers’ faces as they came to realize that a remarkable, sensational, and absolutely gifted actor and actress were walking the streets of good ‘ol New York City. You know her as the Disney X D princess who graces her extraordinary talent in the highly-acclaimed, hit TV show, Kirby Buckets. You know him as the versatile actor who has starred in many fan-favorite projects. I’m talking about the sensations themselves, the wonderful Olivia Stuck and Brandon Tyler Russell. With their incredible talent and their charming personas – the exceptional Olivia Stuck and Brandon Tyler Russell showed NYC what it really is like to be the “City That Never Sleeps”. Whether it is getting angry at her brother ‘Kirby’ for drawing a photo of her titled “Dawnzilla” or losing her gold star as school sheriff, we all are fascinated by the magnificent character of “Dawn Buckets” in Disney X D’s very own, hit TV show, Kirby Buckets. In each and every episode, the marvelous Olivia Stuck always does a mesmerizing job leaving her fans wanting to see more and more of what is to come with the dazzling Dawn Buckets. Her effervescent and genuinely sweet personality and indescribable talent has led her to star in many projects including a highly-anticipated, upcoming movie titled “Outfield” movie also starring Cameron Dallas, Nash Grier, and Joey Bragg (to name a few). Despite the endless amount of successes with her career, the beautiful and fun-loving Olivia Stuck still manages to stay so down-to-earth and she continues to be a terrific role model to all her fans. With movies like “Smitty”, “The Martial Arts Kid”, “Beverly Hills Christmas” and “Hidden Valley the Awakening” – the incredible Brandon Tyler Russell has truly established himself as one versatile and stupendous actor. With each and every role he takes on, the excellent Brandon Tyler Russell allows fans to see his unique acting skills. Brandon Tyler Russell has been recognized by many prestigious award shows including the Young Artist Awards for his remarkable talent and he continues to impress fans worldwide with all his fantastic projects. 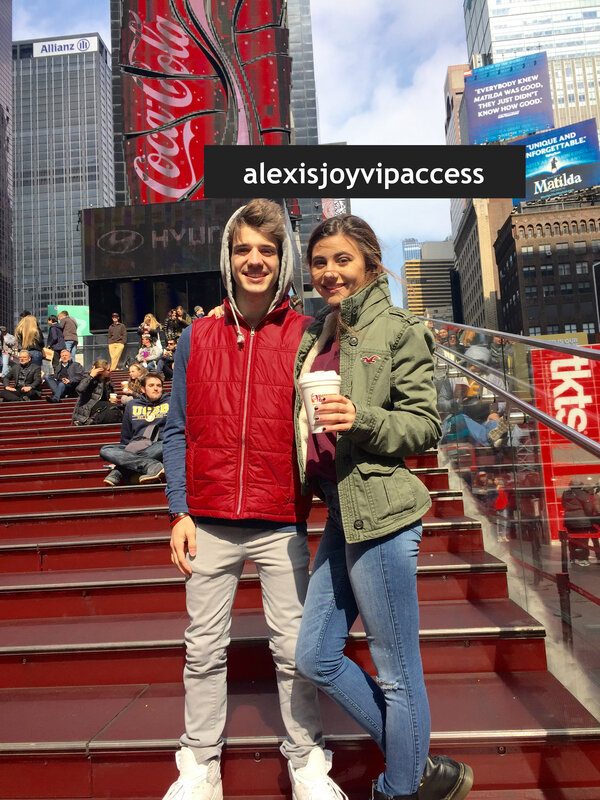 I, Alexisjoyvipaccess had an outstanding time interviewing the fantastic Olivia Stuck and Brandon Tyler Russell in the heart of NYC – Times Square on the red steps! Olivia Stuck dishes exclusively to Alexisjoyvipaccess all about what she would like to see happen to her character in future episodes of Kirby Buckets, her upcoming movie “Outfield” and what it was like working with Nash Grier and Cameron Dallas, what it is like for her seeing herself on TV and so much more! Brandon Tyler Russell dishes exclusively to Alexisjoyvipaccess all about his movie “The Martial Arts Kid”, what character he feels he is the most similar to, what he likes to do during his free-time and so much more! Watch the amazing Olivia Stuck and Brandon Tyler Russell even do a SPEED ROUND only in our VIPAccessEXCLUSIVE interview! Thanks for the terrific interview, Brandon and Olivia! Check out my VIPAccessEXCLUSIVE interview with the sensational Olivia Stuck and Brandon Tyler Russell below!